"During the second 2-year phase, 2014-2016, it invited and then pressured the identified underground churches to register and become Three-Self government churches. "In the current third, 10-year phase, the gloves have come off as both the remaining underground churches and even Three Self churches are being persecuted using Mao-era brute-force, as well as mass surveillance, artificial intelligence, and big data." By 2020, 600 million CCTV cameras - nearly one for every 2 Chinese citizens - will blanket China. They are being forcibly installed inside church buildings to record 24/7 the entrances, stairwells, offering boxes, and Bible counters to monitor who attends church, buys Bibles, and where those Bibles are taken. 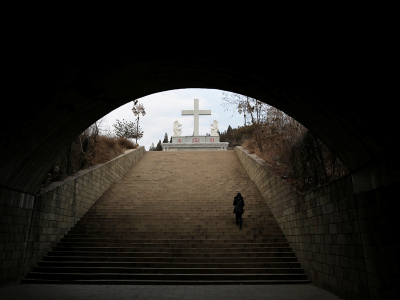 In February of 2018, the Chinese Communist Party also drastically increased its penalties and restrictions targeted against Christians. The government will also tighten up control over religious activities in schools, religious postings online, and trips overseas for religious training. "Things are getting tighter here now, everywhere is facing persecution now. Brothers and sisters are facing difficulties and suffering for their faith. My sister and her husband along with three others were put in jail for their gathering together with about 30 people and their stuff has been taken way with a few big trucks. They were beaten and shocked by the electronic sticks with head bleeding and arms in painful position. David their son saw what happened and cried and fainted there when it happened. "We visited them four days after they were in jail. They were sick; my sister almost had a heart attack and her husband had gout which almost killed him. They were suffering physically and mentally."